I read the first chapter of this book back in 2011 when it was in the first Waterstone’s Eleven. It went on my wishlist then, but it’s was only towards the end of last year that I actually read it. There are four stories in this novel. That of Natalia as a child and her relationship with her Grandfather. The story of Natalia now. And the two stranger stories, those of the tiger’s wife, and the deathless man. All the stories are meant to be true, the stranger stories being stories which Natalia’s grandfather told her about his life. The stranger stories are what make the book really. They have an almost fairytale like quality. I especially liked the tale of the deathless man because it had elements which seemed more real than that of the tiger’s wife, but they were contrasted in the idea of this man who couldn’t die. The idea of a woman falling in love with a tiger was less supernatural I suppose, it’s more how much it was believed I think that was unusual. I did enjoy the writing in this book, however I’d find I got interested in one story only for it to stop and give way to one of the others, and then I’d stop reading because I didn’t want to read that other story. Even though I liked each story on it’s own I wasn’t ready to leave one for another, and that meant it took me a surprisingly long time to read for such a short book. Last year was the first year of the Waterstone’s 11, 11 new authors with 11 new books to be released that year. This year they are doing it again, which is rather exciting. Last year I said I would read the previews of each book which were given on the Waterstone’s website, and I pretty much failed, although I did get round to reading the whole of two of the books, and one was one of my top reads of 2011. I am hoping to do a bit better with that plan this year. When I read the Waterstone’s 11 extract for this I was really excited, the first section with the dead boy was moving but believable, Harri didn’t really know the boy, and was equally sorrowful about the death and intrigued. I must admit though that in some sense the extract and the blurb for Pigeon Englishwere misleading. I expected it to be more about the dead boy, but really it was more about life on an inner-city housing estate and learning about a new culture. That’s not really a bad thing, and actually I think I prefer it that way. In some ways there was a disturbing element to this story, that a boy of such innocence could be influenced in some of the ways Harri was, and could just walk into trouble when really he sees what he is doing as a game. I work in a nursery in an area similar to the one in which Harri lives, and it kind of hit close to home and it makes me hope that things will have changed by the time the kids I work with grow up, I don’t want them to end up in some of the troubles that happen in the area. I found the voice of Harri was really authentic but after a while I did find him a little irritating, especially him constantly saying ‘Asweh’, after a while though I was able to ignore my annoyance as I got more into the actual story. In some ways the way he talked was important to the story, it showed how innocent and naive he really was, and I think that was important, I think I would have just thought he was an idiot if his voice hadn’t been naive, but instead I was wishing for him to talk to someone older about things. The end was absolutely heartbreaking, and brought me close to tears, that’s when I knew I had really come to like Harri. Was it worth my excitement? Not really but it’s still and thought provoking read and well worth the time. So it’s been a while since I’ve done this but I did promise to review extracts from all of the Waterstone’s 11. The Waterstone’s 11 are a group of 11 books by new authors that will (or have) be(en) released in 2011. 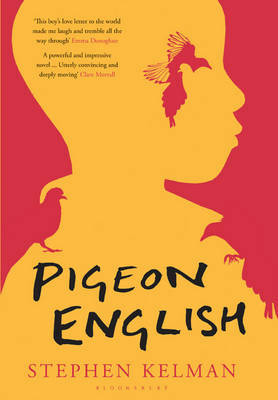 Pigeon English has already been released and I’m quite eager to get a hold of a copy based on the synopsis. I think it would be interesting to see about the contrasting cultures and it sounds like it may be written in a pretty engaging way. Plus on a personal note it sounds like it could be set in the area where I work (although there are areas like it up and down the country). The added crime element I think will add some excitement, which may make it more readable and stop it being to slow or pondering. I liked the tone of Pigeon English a lot, it reminded me of The Curious Incident of the Dog in the Night-Time, and looking at the synopsis again it may have other similarities. The tone was really innocent and child-like but talking about serious things, somehow it made some things seem sadder because it was almost brutally honest. I could really imagine that English was not the boys original language, or at least not the slang that he heard having moved to England. It was really simple and easy to read but I don’t think it lost anything from that, it just seemed more authentic. It makes me more sure that it will be how I imagined from the synopsis, and I certainly would like to keep reading. Forty years in the future. The once-great city of Bohane on the west coast of Ireland is on its knees, infested by vice and split along tribal lines. 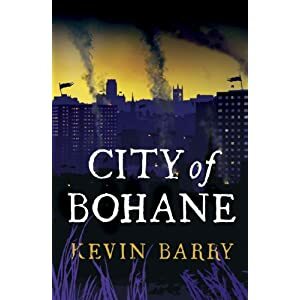 There are the posh parts of town, but it is in the slums and backstreets of Smoketown, the tower blocks of the Northside Rises and on the eerie bogs of Big Nothin’ that Bohane really lives. For years, the city has been in the cool grip of Logan Hartnett, the dapper godfather of the Hartnett Fancy gang. But there’s trouble in the air. They say his old nemesis is back in town; his trusted henchman is getting ambitious; and his missus wants him to give it all up and go straight…and then there’s his mother. I must admit just from looking at the cover of this book I wouldn’t pick it up. I very rarely read crime and this looks pretty stereotypical of crime novels. The synopsis sounds less stereotypical but it still doesn’t make me want to read the book, it just doesn’t seem like my type of thing. Sorry, couldn’t read past the second page, the language grated on me so much. I was crude (which might be the right tone for this type of novel, but I didn’t like it). Lots of seemingly irrelevant swearing (and not even just mild everyday swearing. Some of the language which wasn’t swearing grated on me too, is badness even a word? The Waterstone’s 11 are 11 books written by author who will make their debuts in 2011. The first chapter’s of all the books are posted on the Waterstones Website and I am reviewing all of them. Click the links to see my reviews of The Coincidence Engine, The Tiger’s Wife and When God was a Rabbit. This sounds like it would drag out a little, but could be interesting, the general topic at least interests me but I probably wouldn’t buy it based on the synopsis. Well first off I started reading The Sentimentalists in the middle of February. Straight off I found it a little confusing, and not at all engaging. I had to stop reading and haven’t until now wanted to return to it, in fact the only reason I have returned to it today is because I said I would read all the extracts of the Waterstones Eleven and I want to see that through. It didn’t become any more compelling either when I did get back to it. The tone is quite nice and authentic, when you read it it feels a little disjointed and I didn’t like that, but I suppose it makes it more like a stream of consciousness and in a way that’s good. WHEN GOD WAS A RABBIT is an incredibly exciting debut from an extraordinary new voice in fiction. Spanning four decades, from 1968 onwards, this is the story of a fabulous but flawed family and the slew of ordinary and extraordinary incidents that shape their everyday lives. It is a story about childhood and growing up, loss of innocence, eccentricity, familial ties and friendships, love and life. Stripped down to its bare bones, it’s about the unbreakable bond between a brother and sister. I was glad to find that When God was a Rabbit didn’t carry on exactly as the first chapter had. Although I enjoyed the first chapter I felt like too much happened at one and if that had carried on the book would have been too plot driven for my taste. I can enjoy plot driven books but I never find that they really get into my mind and stay with me, I can say I thought about When God was a Rabbit when not reading it. It was still very readable, which is an element sometimes lost for more ponderous writing. Although at times there wasn’t a great deal happening a sense of atmosphere was really well built and the characters were easily loveable. I especially liked Elly- although that may be simply because I got to know her the best. I didn’t like Joe so much, there was something a little self serving about him, but I can see why he might be like that considering certain events (highlight for spoiler)I think maybe he was trying to protect himself from further heartbreak, especially considering the way he was towards Charlie the second time. I also think that he maybe was trying to protect himself from hearing another secret from Elly, a secret that effected both their lives, or even trying to stop himself from revealing it. I did find the synopsis on the back of the book a little misleading, it suggested that it was a story of a brother and sister, it was that but it was also much more, it was a story about family, and friends, and life. I must admit on reading the synopsis thinking that it was a story about a brother and sister put me off a little, and I may never have really wanted to read it without more information. I’m glad I did read it though. It was very touching, and sad, and funny. Really quite beautiful. If I had to say anything bad about it I would say that it was maybe a bit too issue-y and that made it a little far-fetched and unbelievable. I also did have a feeling at the end that some things had not been revealed, although if you tried to get me to tell you what I don’t think I could, at least not without a re-read. The Waterstone’s 11 are 11 books which will be released by debut authors during 2011. You can read extracts of all the books on the Waterstones website. I’m posting my thoughts on the extracts here on my blog. So far I have posted on When God was a Rabbit and The Tiger’s Wife. This sounds really confusing and over complicated. If I read this synopsis on a book in a shop I probably wouldn’t buy it. The cover looks like the types of books I pick up but never buy. I was confused pretty much from the onset, partly because it dived straight into the plot with no explanation and then kept switching between different plot lines. Partly because of the way it was written, I felt like I had to re-read most sections at least twice to understand them. It did get easier as I went through so maybe the style just takes some gettings used to, and I had a slight sense of intrigue, but not enough for me to want to go out and buy the book. At one point it made me laugh but I wasn’t entirely sure I was meant to. The Waterstone’s 11 are a list of books by new authors to watch which will be released in the next year. You can read the first chapter of each book on the Waterstone’s website. This is the second of my mini-reviews. 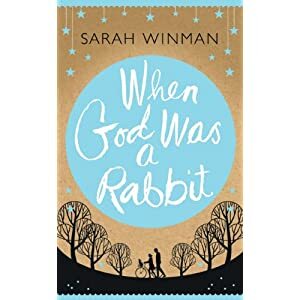 You can find my review of When God was a Rabbit here. I’m immediately put in mind of The Life of Pi, but it does sound ever so slightly more realistic! I loved The Life of Pi so if it is similar that would certainly not be a bad thing! The Waterstone’s 11 is a list of 11 books by 11 debut authors which will be released in 2011. Books that they think are worth reading. They’ve provided a sample from each book on their website, and I’m going to read every one. WHEN GOD WAS A RABBIT is an incredibly exciting debut from an extraordinary new voice in fiction. Spanning four decades, from 1968 onwards, this is the story of a fabulous but flawed family and the slew of ordinary and extraordinary incidents that shape their everyday lives. It is a story about childhood and growing up, loss of innocence, eccentricity, familial ties and friendships, love and life. Stripped down to its bare bones, it’s about the unbreakable bond between a brother and sister. Wow that is a lot to happen in 20 pages. I liked it but felt like the writer was trying to keep the plot going with lots of events rather than the bits in-between, after a while that might get to much. Having said that it made me laugh, and I can imagine that it could make me cry when I feel more in-touch with the characters. I liked the tone, pretty easy to read and engage with, at the beginning at least it reminded me a little of Middlesex, it had a similar tone and it sounded like the topic could even be similar. I certainly would be interested in reading more, if not all of it.